The growing minority population has gradually reduced the share of the white vote required for Democrats to secure to win the Presidency. In 2004, Kerry won 41 percent of the white vote and lost by three percentage points. If Obama received 41 percent of the white vote, he would have won by three percentage points in 2008. With Obama poised to approach or repeat his historic performance among non-white voters, the question is whether minority voters will again turnout in record numbers, and whether Obama will win enough white voters to put him over the top. Will minority voters turnout? On Wednesday, Obama campaign officials predicted that minority voters would represent 28 percent of the electorate in 2012, up from 26 percent in 2008. The minority share of the voting eligible population grows every year, so increases in the non-white share of the electorate are certainly possible. Of course, diminished enthusiasm among young and black voters could prevent Obama from capitalizing on favorable demographic trends. The Obama campaign's recent decisions to endorse gay marriage and end deportations while offering work authorization to certain young undocumented immigrations appear aimed at re-energizing young and Latino voters. Can Obama win the necessary share of white voters? Certainly. After all, even Kerry and Dukakis matched or exceeded 40 percent of the white vote. 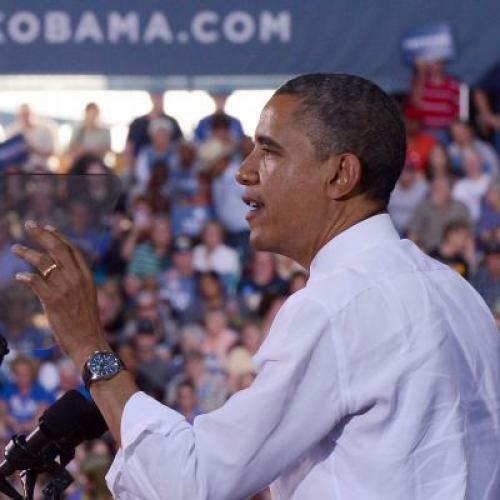 Will Obama win the necessary share of the white vote? That is tougher to say, but two articles on RealClearPolitics by John Ellis and David Paul Kuhn contend that Obama stands beneath the threshold for national victory among white voters and that the outstanding white vote may deliver Romney the presidency. Although their basic calculus is accurate, they construct an unrepresentative and Romney-friendly picture by cherry-picking polls to fit their narrative. Depending on the exact non-white turnout and vote, Obama could require between 37 and 40 percent of the white vote to win a plurality of the national popular vote (in 2008, the magic number was 38.5 percent). *** David Paul Kuhn selects a relatively high but defensible threshold—39 percent—and asserts that Obama’s floor among white voters has “broken” as recent polls show Obama holding between 37 and 38 percent of the white vote. But Kuhn only considers four polls, including two of the most favorable for Romney. Worse still, Ellis only focuses one poll: a Fox News poll showing Obama at just 35 percent of the white vote. An average of recent polls shows Obama holding 39 percent of white voters, enough to win reelection under the turnout scenario envisioned by the Obama campaign and enough for a tied election under Kuhn’s scenario. Only the Fox News poll places Obama’s support outside of the range where non-white voters could realistically put Obama over the top, but the same poll showed Obama’s approval rating among white voters at 41 percent, suggesting that if the Fox poll had pushed undecided white voters to the same extent as other firms, Obama’s standing among whites probably would reside in the toss-up range. There is no guarantee that Obama improves his standing among white voters, but two factors work in his favor: the inevitable break of some number of undecided voters toward Obama, and the equally inevitable break of some undecided voters toward their couch, which has the effect of boosting Obama’s share of those whites who actually turn out and vote, compared to Obama's share of all registered white voters. On the other hand, the undecided are disproportionately working class voters who harbor deep reservations about Obama’s performance. Romney has challenges of his own. 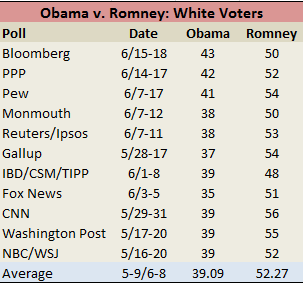 No poll has pegged Romney near 60 percent of white voters—his own magic number under reasonable circumstances. The Obama campaign’s expensive effort to cast Romney as a corporate plutocrat seems targeted at precisely these undecided white working class voters, and given that many of these voters have traditionally voted for Democrats in national elections, the attacks seem likely to resonate. Few would contend that Romney holds a special connection with white working class voters, and the danger for Romney is that many of these disaffected and dissatisfied voters simply might not turnout. With Obama all but assured an overwhelming share of the non-white vote, the Obama campaign has two tasks: capitalize on demographic changes by rekindling the enthusiasm of Obama’s young and diverse coalition, and prevent Romney from assembling enough white voters to overcome. Regardless of whether the Obama campaign succeeds, there is no question that the Obama campaign’s tactics are driven by these two imperatives. Indeed, most of the Obama campaign’s early efforts fall into two corresponding categories: depicting Romney as a corporate raider and adopting policies enthusiastically supported by young and Latino voters. Obama wins reelection if Obama can prevent Romney from consolidating the undecided white vote, maintain his current share of the white vote, and capitalize on favorable demographic trends. Chicago knows it. ***Obama would require 40 percent of the white vote if minority turnout falls to 25 percent of the electorate and only 77 percent of minority voters support Obama. Obama would only require 37 percent of the white vote if the minority share of the electorate increases to 28 percent of the electorate, as foretold by the Obama campaign earlier this week, and 80 percent of non-white voters support Obama, as they did in 2008. The targets allow Obama to exceed 49.24 percent of the popular vote, which represented 50 percent of the two party vote in 2008.